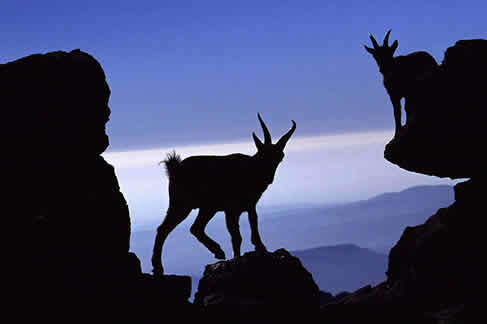 LAS CABRAS ACUDEN DE CUANDO EN VEZ, CADA X TIEMPO A LAS ALTAS ROCAS A DIVISAR EL HORIZONTE Y LA SENDA DEL TIEMPO. SUELE HACERLO UNA CABRA DE LA MANADA, LA QUE TIENE EL ASPECTO DE SER LA MÁS OSADA, A VECES DA LA IMPRESIÓN DE SER "ATREVIDA", TENER IMPETÚ Y VALENTÍA FRENTE A LO QUE VE. LUEGO REGRESA CON LA MANADA MIRANDO AL SUELO. SON MUY BONITAS, Y HACEN ESTO DESDE LO ALTO DE LAS MONTAÑAS. HE VISTO TAMBIÉN GAMUZAS Y GACELAS PERO NO ME HE FIJADO TANTO. SU "ACTITUD" ES TENSA Y FIRME Y NO TEME CAER EN EL PRECIPICIO DEL VALLE. 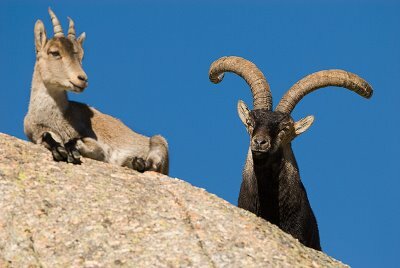 LUEGO REGRESA PENSATIVA JUNTO CON LAS DEMÁS CABRAS CABIZBAJA RETORNA CON EL GRUPO. HA CAMBIADO SU TESÓN Y SU FORTALEZA POR UNA VIDA CÓMODA EN LAS GRANJAS Y FINCAS AGRÍCOLAS.